Tom Wade and Al Smith had a very productive and satisfactory 2 days at Cape Henry. The assignment was to clean the Barbier & Fenestre's 1st Order lens. "It hasn't looked this good in years." John Starling commented. It was brighter than John has ever seen it, and this was on the first day before we were finished. 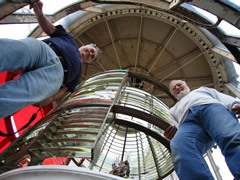 Tom and Al cleaned inside and outside the lens and Tom polished the manufacturers name, date and the "BF/66" for visitors to see. For those that didn't already know, the lens was built in 1880. Tom, Al and John did have a very nervous and agonizing wrap up of the first day. The Coast Guard had turned off the lamp so Tom and Al could work inside the lens. When the workday finished on Monday, John threw the main power switch according to Coast Guard instructions -- the lamp did not light. "We tried a number of times without any luck." Tom reports. When all else fails, should you kick start the equipment? 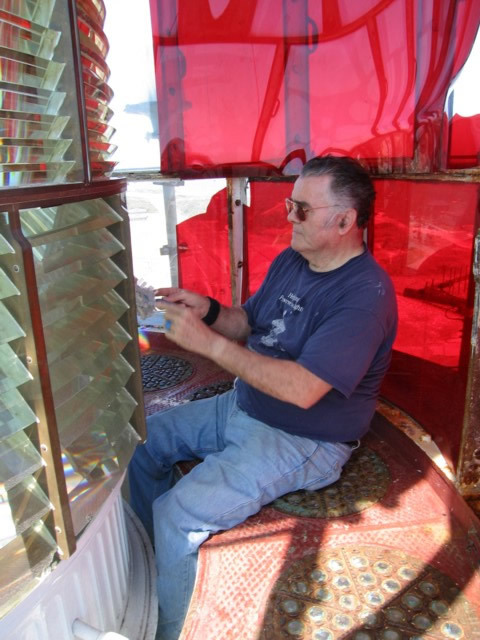 John Starling notified the Coast Guard that he was unable to reactivate the light. This light is operational 24/7 and the cleaning crew were very concerned! By 7:30 p.m. that evening the light was back on. Tom and Al are happy to report that during the lights time off there were no tankers or aircraft carriers that ran aground! If you would like to be more involved and have not yet done so, fill out the 2005 Volunteer Form. Photos courtesy of Tom Wade. For A Larger View. Tom and Al standing next to the first order Barbier & Fenestre's lens. For A Larger View. 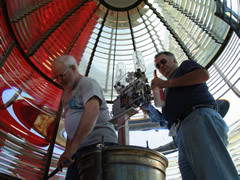 Tom Wade working on cleaning the lens in Cape Henry Light. For A Larger View. Tom and Al inside the first order lens.